Burmester develops 3D sound system for new Porsche Panamera | What Hi-Fi? 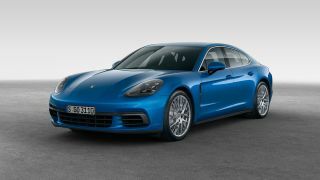 Porsche's second-generation Panamera arrives in November and the company has teamed up with fellow German brand Burmester to design a new high-end sound system for the car. Burmester's partnership with Porsche dates back to 2009 when the high-end hi-fi manufacturer launched an optional surround sound system for the original Panamera. So it seems only right that the second-generation of Porsche's four-door saloon has a second-gen Burmester sound system on its options list. The new Burmester 3D High-End Surround Sound System features 21 speakers dotted around the interior of the car, five more than the 16 speakers in the original Panamera. Key new features included a speaker positioned in each of the car's A-pillars and the use of Auro 3D sound processing technology. Combining the two is supposed to create a more three-dimensional sound which, according to Porsche, is "reminiscent of the best concert halls in the world". Total power is a claimed 1445 watts, and the complete speaker assortment is as follows: four bass drivers, seven mid-range drivers, two ribbon tweeters and seven normal tweeters. The subwoofer is positioned in the rear of the car. The Panamera system uses lighter, more efficient versions of the manufacturer's ATM (Air Motion Transformer) ribbon tweeters, which claim to not only provide greater realism for instruments and voices, but supposedly improve the vocal quality of the hands-free and sat-nav systems. Developers have shied away from using traditional surround sound processing used in cinemas, and have instead opted to work with Galaxy Studios in Belgium to design an algorithm best suited to music playback. It's claimed the processing can subtly "extend the sound in front of and even above the listener". Burmester has also included special sound-enhancing tech for highly compressed audio streams over Bluetooth, as well as a 'smooth' function for relaxed listening over longer drives, a variable 3D function and the option to focus the sound on specific seats in the car. If you're in the process of configuring your dream Panamera, the new Burmester 3D High-End Surround Sound System is available now, priced £4869 for the Panamera 4S and Panamera 4S Diesel and £3846 for the speedier and more expensive Panamera Turbo.